ASM Traffic is the model for simulating vehicles, traffic participants, traffic objects, and vehicle sensors. It allows to efficiently develop and validate driver assistance systems in virtual environments. Realistic traffic simulation includes car2car and car2x communication. 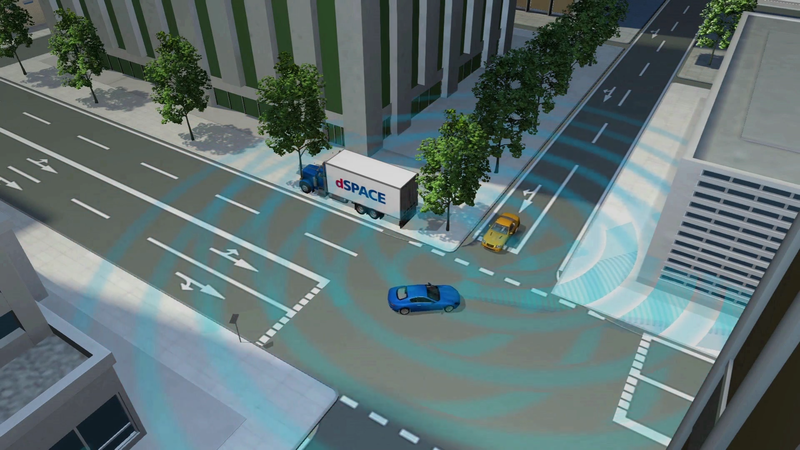 To demonstrate the feasibility of a vehicular ad hoc network (VANET) simulation concept, the following setup was implemented: ASM running on a dSPACE SCALEXIO HIL system, Veins1) C2X simulation running in OMNeT++2), and SUMO3) performing traffic simulation. This concept as a foundation, enables future research to harness combined benefits of highly detailed HIL testing embedded in large-scale VANET traffic scenarios. The tool chain can be used to analyze ADAS at unpreceded levels of detail and context. 1) Veins is an open source framework for running vehicular network simulations. 2) OMNeT++ is an event-based network simulator. 3) SUMO is a road traffic simulator (simulation of urban mobility). A hardware-in-the-loop (HIL) simulation of an advanced driver assistance system (ADAS) for adaptive front lighting was coupled to a driving simulator with a reconfigurable motion platform and a high-performance visualization system. This made it possible to integrate a real driver in the closed control loop. This combination is called driver-in-the-loop (DIL) simulation. HIL simulations are sufficient for validating the correct functionality of vehicle control systems. In contrast, ADAS require the DIL approach because they support human drivers rather than directly taking action in vehicle stabilization. With DIL simulation, it is possible to ensure that an ADAS is functioning correctly and to test its acceptance by the real driver on a simulator during the development phase. ASM Traffic for virtual test drives in virtual traffic environments. ASM Traffic adds traffic and environment simulation to dSPACE’s Automotive Simulation Models (ASM). It supports you in developing and testing advanced driver assistance systems (ADAS) that react to other vehicles or objects, like adaptive cruise control (ACC) and intersection assistants. The model simulates a road network, the vehicle under test, a multitude of fellow vehicles, and the necessary environment. The test vehicle can be equipped with multiple sensors for object detection and recognition (ego-vehicle). ASM Traffic is typically used for hardware-in-the-loop testing of electronic control units (ECUs) or for early function validation by offline simulation during the design phase of controller algorithms. ASM Traffic is so flexible that any kind of traffic scenario can be created. This is the prerequisite for thorough testing of ADAS ECUs. ASM Traffic supports the creation of complex road networks, and you can define sophisticated traffic maneuvers on the roads. The simulated environment can consist of static and movable objects, like traffic signs and pedestrians. Various sensor models and user-definable sensors are available to detect these objects. To test precrash functionalities, you can define traffic scenarios that could result in an accident in real life, and observe system behavior under challenging conditions. You can modify and immediately simulate traffic scenarios without having to generate code again. ASM Traffic consists of a graphical user interface (GUI) and a set of simulation models that perform in real time. The GUI provides several interfaces for defining the necessary components like road networks, traffic signs, traffic vehicles, and sensors. Trajectories for all vehicles, objects, and pedestrians are calculated in real time according to the defined traffic maneuvers. ASM Traffic supports specific scenarios such as oncoming traffic, stop and go, and pedestrians. The Traffic Editor is the user interface for very flexible and easy traffic scenario definition.